Dive deep under the water surface to try and locate a unique Shark School designed to teach the underwater animals skills needed to survive in the unforgiving ocean. Various shark species have start bullying younger students so it will be up to you and the teachers to try and save the little fish from being eaten by the sharks and the school staff will find a way to repay you for all the help should you prove successful. Shark School is a cute video slot released by Realtime Gaming in April 2014, featuring five reels, fifty paylines and four rows of game symbols. While supporting a wide array of betting options, the game is also well equipped with special perks and benefits that include Wild symbols, Scatter Pays and no less than three bonus games that offer free games, instant credits, multipliers and more. 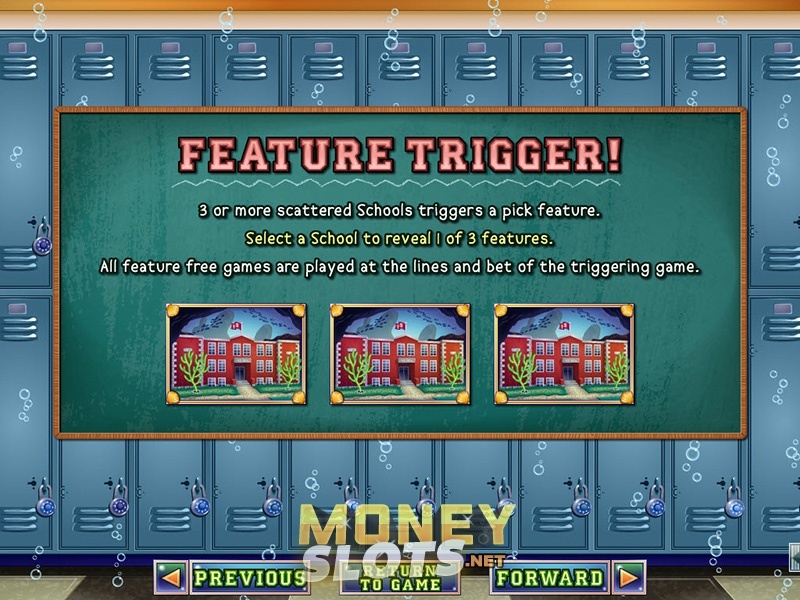 While Substitute Teacher and scattered School symbols are in place to help improve your line wins, four shark species and as many fish representatives lead the way when it comes to regular game icons that offer decent payouts in the main game, with playing cards Nine, Ten, Jack, Queen, King and Ace complete the list. There are a total of four icons paying out for two or more on a payline, whereas the remaining symbols pay for three or more. All you have to do before pressing spin or auto play is activate between 1 and 50 paylines and choose coin value from $0.01 to $5. Octopus Teacher acts as a substitute, appearing stacked on reel 1 and replacing all game symbols, including scattered Schools. Three, four and five School Scatters occurring anywhere award an instant credit win of 2x, 5x and 100x total bet respectively, while also triggering a Pick Feature. Help the fish escape the jaws of the shark in Swim Fishy, Swim! and you will receive a price of 200x total bet. Free games are played until the fish is eaten or it escapes after 25 rounds. Bad Sharky! feature triggers 3-10 free games, where one of the sharks covers an entire reel 3. Any fish that gets eaten in the process is replaced by shark symbol. Help the Teacher survive the attack of the sharks and increase the multiplier by 1 each time it survives. Multiplier starts at x2. A bonus of 100x total bet is awarded in case the Teacher survives 25 free games.